My first words go to Andy Murray, he is a very talented player, a really good one, best of best and yesterday during the first set he proved it once again. What a first set, there was no way I could keep up with his shots! I always say it but it will be sooner than later that he will win a Grand Slam. And I also think that even if he hasn't won a major yet, he is much better than some players that have won one! And my next thing is to thank the crowds! Once again they proved how respectful, fair and knowledgeable are. These are arguably the best crowd in the World since they have always been very supportive with their local player but also with the rival. Every time I've played here they have been like this! Really feel good here! And to finalize, wanted to congratulate Novak for being number one. He has been the best player so far this year and deserves to be the ATP World number 1. 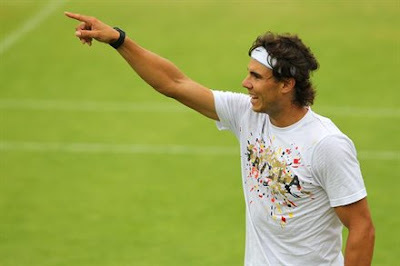 Ask Rafa: I'm thinking about joining Twitter, but I won't tell you when yet! Yes, I am really looking forward to coming back here next year twice at least. The Olympics is something special. I will be staying during Wimbledon at the house I rent, but during the games at the Olympic village with all the athletes. I loved that atmosphere and would like to live it again! Hahahahahah. We started like that one day and now we all call him like that. He didn't like it much at the beginning, but now it's OK. I actually love all their designs. I love the fact that they always have live colors, except here the white of Wimbledon, which I also think is special and like it. Yes, I am thinking about it. Not sure if it will be right after Wimbledon or when we go to Montreal. True. I suppose that the picture at that gorgeous stadium is strong enough for them. Maybe the first one would be in front of the Big Ben I suppose. Will have to ask Benito Perez-Barbadillo, my publicist. I have never ben to Hungary, but I hear it is beautiful, especially the capital, Budapest. I love many things of many countries, especially cities like Paris, Rome, London and many others.